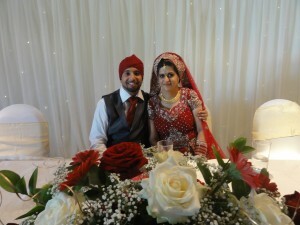 Making History In Hounslow: The Wedding of Sapna and Ranjit. Sapna and Ranjit made small history in Hounslow today as the first Indian Bride and Groom to hold a wedding reception at this venue. Lampton conference centre is part of the Hounslow Civic Centre, which is usually meeting the needs of its local community, but this Sunday it opened its doors to a big fat Indian wedding. 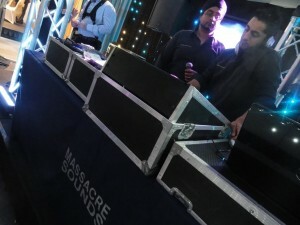 The music, the LED dancefloor, decor, table pieces and chair covers were all provided by Massacre Sounds Entertainment. We escorted the couple into the reception suite, which was followed by the wedding cake cutting and their first dance. There was also some fantastic professional dance performances which I think got people into the dancing mood. There was also a ‘Saggan’ ceremony where friends and family individually came to greet the couple and give them their love and best wishes. The delicious starters and dinner was provided by ‘Passage To India’ caterers: there was a great selection of dishes in the rotating centre-pieces on each table – a truly first class service! Once the guests were fueled up and raring to go the Massacre Sounds DJ’s took over the show and played a good mix of bhangra and bollywood to keep the crowd on their feet. I must say, during our dancefloor performance , I saw bhangra moves that could impress the judges on Britains Got Talent. 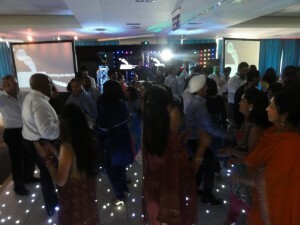 A great first Indian wedding party, at the Lampton Conference Suite.